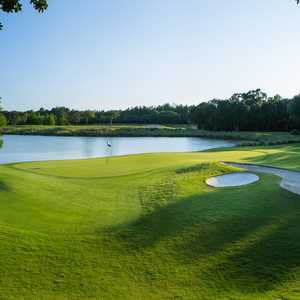 The course is a unique and historic collaboration between Arnold Palmer and Jack Nicklaus and opened to the public in November 2000. 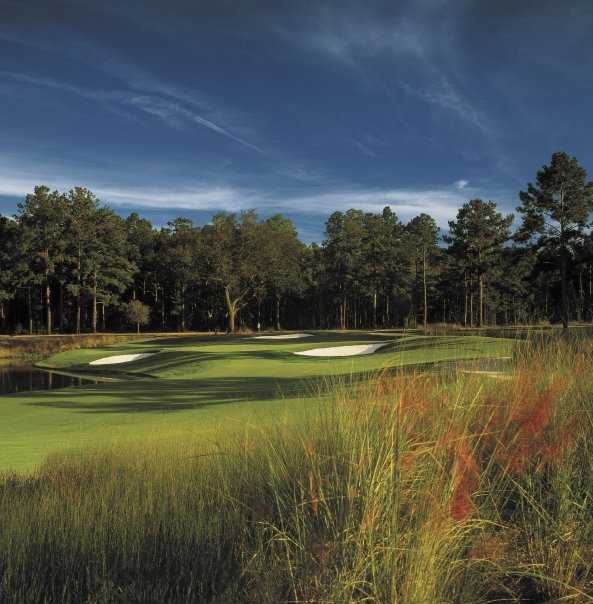 The King & Bear is an 18-hole, par 72, 7,200-yard course featuring loblolly pines and open meadows on the front nine and the natural beauty of 200-year old live oaks complementing the back nine. 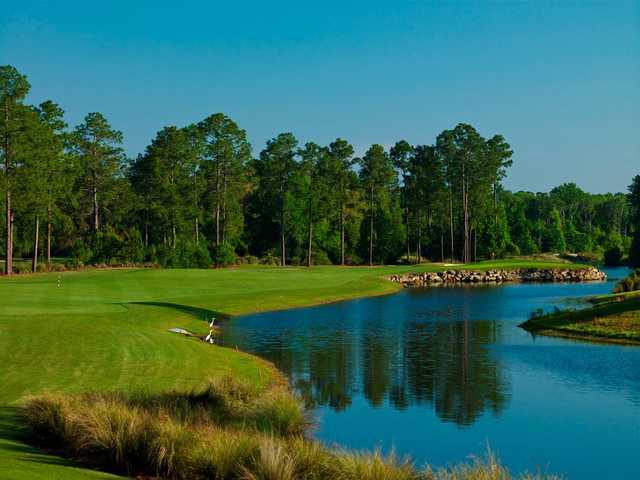 The signature feature of the course is placid lakes edged with large coquina rock. These beautiful lakes come back into play on 16 of the 18 holes. Coquina rock is also incorporated into several bunkers and cart paths, lending visual texture to the stunning natural refinement of the land . 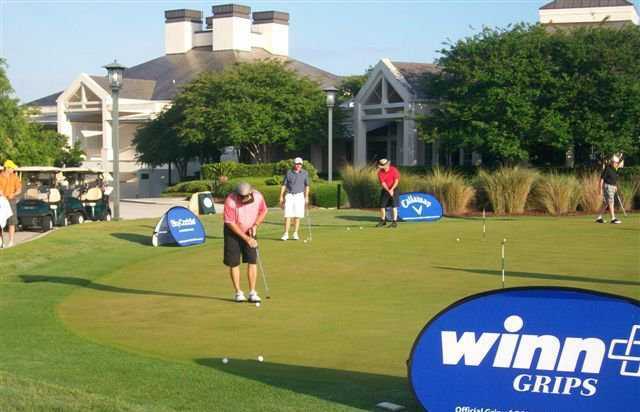 This course is will challenge the skilled golfer while still being friendly to the novice. Every tee shot offers you a unique look and a new opportunity to strategically plan your play. The King & Bear eagerly awaits you. The King & Bear golf course at The World Golf Village in St. Augustine, FL is, in the words of co-designer Jack Nicklaus, “a collaboration of two friends, and an opportunity to bring a friendship together.” The “King” - Arnold Palmer - and “Bear” Jack Nicklaus, joined together to create a course where each hole exhibits characteristics of both players. For Nicklaus, it’s the wide fairways and generous landing areas off the tees whereas Palmer prefers the fast greens. At the time it was built, King & Bear was the only course in the world that the two had built together. The King & Bear course offers five sets of tees, creating an enjoyable time for any level of golfer. From the back (Stone) tees, the course measures 7,279 yards with a course rating of 74.1 and a slope of 138. Most men will get all they can handle from the Blue Tees (6,506/70.8/131), while the Ladies play from the Green Tees to a yardage of 5,119 (69.1/124). It would be fitting to mention at this point that King & Bear has been ranked in the top 100 Women-Friendly Courses by Golf for Women Magazine. 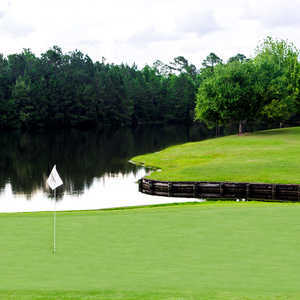 The course meanders around pristine lakes and ponds with beautiful loblolly pines and stately oak trees throughout. These trees are spectacular to look at; that is until they impede your shot! The emphasis here is on a part of the game that both men were famous for – driving the golf ball. Water hazards are plentiful too. During the winter month, King and Bear over seeds their tee boxes, fairways and greens, producing a brilliant green color which provides a stunning contrast to the dormant Bermuda grass. It also makes for some fabulous playing conditions during the winter months. Another nice touch are the free chilled apples on the 1st tee and as you make the turn at the 10th. If you are inclines to walk the course, World Golf Village recently introduced a new caddy service. Check with the pro shop before your round to get more information. Not far from the clubhouse is a full length driving range with multiple targets, an impressive short game area and a large practice putting green. Many players come to the King & Bear just to use the practice facilities. Range balls are included with your paid greens fee. Inside the King & Bear clubhouse, you’ll find a full-service pro shop with all the latest logoed gear from top designers. There are men’s and women’s locker rooms with showers and changing facilities, so you can freshen up before heading home. You’ll also find The Champion’s Grille, with food fit for a King – and a Bear! The restaurant is open for breakfast and doesn’t close until 7 pm, so you can grab a bite no matter when you finish. For breakfast, you can’t go wrong with the Eggs Benedict and for lunch their chicken wings are big and meaty, and their burgers hit the spot. Rest assured, you won’t leave hungry. There are also several large screen TVs where you can catch the latest sporting events as well as a daily happy hour. Number 1: Par 4, 381 yards. At first glance, #1 gives you the idea that the landing area is very small, but trust me, there’s a lot of room there. Ideally, a tee shot over the water and bunker towards the left center of the fairway leaves a low to mid-iron approach into a well-guarded green. Par is a great way to start. Number 6: Par 3, 157 yards. This par three that has it all: trees galore, water and beach bunkers. A pin placement on the right side is best attacked with a fade. Anything long and left may find the back bunker. The green is long and narrow with substantial undulation. There’s a bailout area short left of the green if you’re feeling overwhelmed. Number 10: Par 4, 375 yards. It’s time to make a choice. A drive down the left side brings water and a coquina shelled waste area into play. The right side is the easier drive but brings a deep, menacing greenside bunker into play on your approach shot; too far right and you’ve got trees to deal with. The fairway slopes dramatically from right to left, so you may not have a choice. Another hole where par is a good score. Number 15: Par 4, 311 yards. This is Mr. Palmer’s favorite hole on the course and is easily the most photographed. It’s s a short par 4 that requires accuracy off the tee. With large Loblolly pines on the left side and a lake to the right, a long iron, hybrid or fairway wood is all you’ll need off the tee. 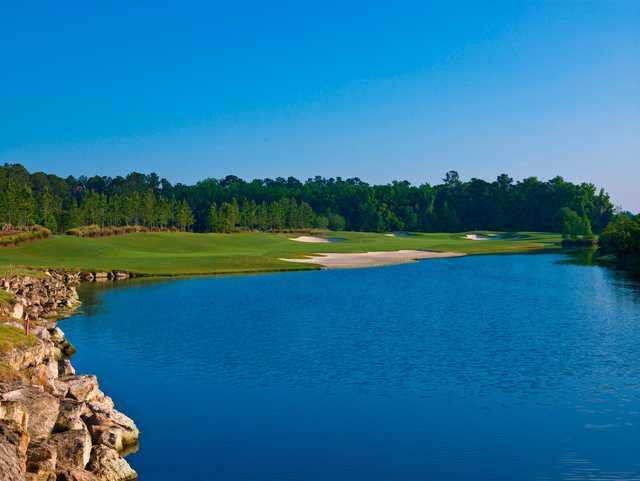 From there, you’ll most likely have a short or iron or pitch shot over a stunning rock wall that surrounds the peninsular green; odds are that you’ll have to carry all or part of the water. Beware of the deep bunker long and left. Make your par and thank Arnie. Number 16: Par 4, 416 yards. Jack Nicklaus has a favorite hole here as well. It’s Number 16, a brutally long par 4, dogleg right. The oak trees down the right side keep you honest while the Loblolly pines on the left catch any shot missed that way. One particular Loblolly sits on the left side of the fairway. Regardless of how well you strike your drive, you’ll most likely be facing a long iron, hybrid or fairway wood into the green. An extremely large bunker guards the front right side of the green and catches many shots short of the green. Last Word: The best way to derive the most pleasure from this course is to play from the tees that best suit your handicap and playing ability. When in doubt, take Jack’s advice and tee it forward. The King & Bear will surely challenge the skilled golfer while providing player-friendly conditions for the novice. The traits of both designers are readily visible in this layout: coquina shelled waste areas and rock-fronted greens are found throughout the course. There are no outrageously long carry shots from any tee, but there is a certain amount of strategy required if you want to score well. Having an idea of where to hit you tee shot on some of the par 4 holes is something you will remember when you play the course a second time. And, as mentioned earlier, the emphasis here is on driving the ball. A good game from the tee boxes goes a long way in shooting a good score here. Compared to other Nicklaus courses, the greens are friendly, although the subtle breaks you find throughout this layout can spell trouble on the scorecard. To Arnie’s credit, the greens do tend to run fast. 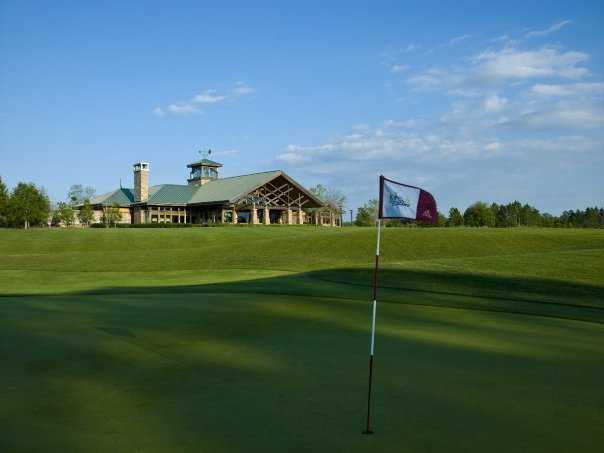 The course is well maintained and the staff is warm, friendly and anxious to help you make the most of your golf experience at The King and Bear. World Golf Village, The Slammer & Squire and The King & Bear makes for a great weekend of golf, whether it’s a family outing or a mancation. Throw in the World Golf Hall of Fame, where both designers are members, and the IMAX theater and what else can a golfer ask?